This sunny little flower is a perfect herbal remedy for spring! Spring is the time for new beginnings, so this is a good time to start a new tradition at Spirit of the Bear. Beginning today, I’m going to have a featured herb of the month each month. So spring is finally here, Yay!!! And, although you would have hardly known that from the blanket of snow we had on the ground Easter morning this week, our bodies are quite aware of the change in the seasons. We have very different needs with each season, and herbs can be a really good support for this. Winter is cold and harsh and our bodies want to store up nutrients and fat to get us through until spring. It’s actually natural and healthy to gain a little weight in the winter. Our bodies need warming and nourishing foods during the cold of winter to help maintain our energy and vitality. And our digestion wants warm and spicy foods to keep the digestive fire burning. But with the onset of springtime and warmer weather, it’s time to shed some of the excesses of winter and lighten up for the hotter days of summer that will be here soon. Between the heavier foods we eat in the winter and the reduced physical activity, there can be an accumulation of toxins, too. A liver that’s overburdened with toxins can contribute to a great number of health problems – digestive troubles, arthritis, allergies, and more. So spring is the time when our bodies are most ready for purification, detoxification, and shedding any extra pounds. These are the natural cycles we go through with the seasons. In Chinese Medicine, spring is the season of the liver, and it’s easy to see why. The liver is our primary organ for removing toxins from the body. The liver loves to do some detoxification during spring. So with this in mind, dandelions (Taraxacum officinale) are a great choice for the herb of the month at the beginning of spring! They are wonderful for the liver and even some of the other organs of elimination. These sunny yellow flowers are perfect for doing a little spring cleaning in the body. Actually every part of the dandelion is used in herbal medicine – the flower, the leaves, and the root. The roots have a particular affinity for the liver. The bitter taste helps to stimulate healthy digestion and is helpful for chronic constipation. (The flavor of bitter is really good for the digestion.) Dandelion root is also great for promoting an environment for the good bacteria and flora to live in our guts. The leaves support the kidneys, helping to eliminate excess fluids and can even be beneficial for losing weight. If you’re shopping for an herbal tea this month, you might want to look for ones that feature dandelion. If you’re really feeling adventurous, you could even buy some bulk dandelion root and leaves and make your own teas. Some people even enjoy using roasted dandelion root as a substitute for coffee. Yum! Dandelions will be growing bountifully in the wild soon, too, so you could also harvest your own. Just be careful to not get any that could have chemicals on them. You’ll want to stay away from ones that are near a road or in areas where the lawns are treated with pesticides, herbicides, or fertilizer. And finally, if you normally try to kill the dandelions in your own yard with chemicals, I ask you to please reconsider that. The chemicals are very toxic and harmful to the environment. And bees have been having a tough time surviving the last few years. They need the dandelions! 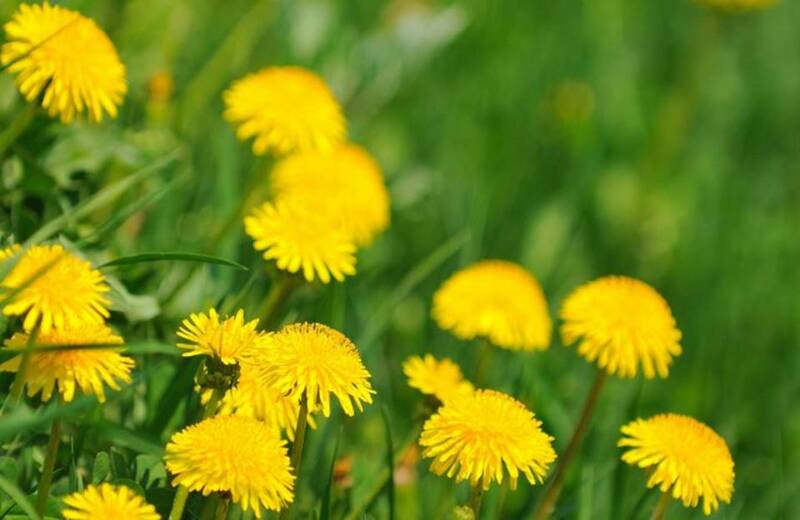 Dandelions are actually one of the most commonly used herbs in herbal medicine and have amazing health benefits! Take a handful of dandelion flowers and pour a cup of boiling water over them. Let steep for 10 minutes. Sweeten with honey and enjoy! You’ll need equal parts dandelion flowers and room temperature water. So for example, four cups of dandelion flowers and four cups of water. Put the flowers into a glass jar and cover with the water. Add the juice of one lemon per two cups of water. If you’re using organic lemons, you can add the lemon peels for more zest. You could try adding a few other flowers like lavender or violets. Let this sit for a few hours. You can even put it in the sun for some sun tea. Then add a little honey to taste. Chill if desired. Strain or leave the flowers to add a decorative touch when you serve. In a saucepan over medium heat, add 4 tablespoons of dandelion root and roast until it’s golden brown. Add a quart of water and some seasonings if you want. A little cardamom and fresh grated ginger are nice and are great for the digestion. Bring to a boil and gently boil for 30 minutes. Strain, add a little honey to taste, and enjoy! Flower essences are liquid extracts of flowers used to address emotional well being and mind-body health. Dandelion flower essence is used for providing support when we put too much pressure on ourselves to be driven and accomplish or when we’re feeling tense, rigid, or stiff, especially in our muscles. In Chinese Medicine, these emotions and the physical conditions that go with them, especially the tension of the muscles, correspond to the wood element – the liver, and the season of spring. And that’s exactly what dandelions are so good for supporting. P.S. If you’re interested in using herbs as part of your health regimen, I encourage you to make an appointment with a clinical herbalist like me and get a personalized recommendation. By having a consultation with a professional herbalist, you’ll know that you’re get a recommendation for appropriate herbs for your needs and desired outcomes and that you’re using them in the correct dosage and preparation. This way you can be sure you’re receiving the benefits that you want from using them and save yourself a lot of money and frustration that comes from using the wrong herbal therapies.